I'm currently working on a new project (in German this time!) and am trying to identify the British unit targeted by a Saxon trench raid. From approximately 11th August to 7th October 1917 the Saxon 24. Infanterie-Division (henceforth, 24.ID) held a sector west of Houthem, for which we regrettably lack adequately clear maps. Infanterie-Regiment Nr.133 from Zwickau (henceforth, IR 133) was on the left - their subsector certainly included the spot on the map below marked '7442', but its boundaries are likewise unclear. My current objective is to identify the British unit targeted by IR 133, so that I can hunt down the relevant war diaries for comparative analysis. The best lead I have is a bit of German intelligence quoted in Sachsen in Grosser Zeit - on the night of 27th-28th August, IR 179 (immediately to the north / German right of IR 133) identified the British 30th Division opposite during forward patrol clashes in their subsector. Can any British Army experts assist me? Any clues will be most gratefully received! I'm afraid these aren't the best, as they are cropped from photos, not scans. You would appear to be on the right track with 30th Division, but I don't have anything to pin it down closer. If you go to the Brigade level diaries though, it shouldn't take too long to find exactly who was in the front line. Thanks Phil, that's excellent! The British assessments of German divisions (especially Saxon 24.ID, 40.ID and 23.RD) are also highly interesting. I'll pass this on to my co-author Herr Schmieschek. I had a quick look this morning. The War Diary for the 30 Div HQ 01/09/1917 records, "Enemy carried out a small raid against the right Brigade during the night". Appendix 1 is Operational Order 119 which shows which Units were to relieve, or be relieved by, others. There is also an Intelligence Summary for 8pm (2000 hrs) 01/09 to 8 pm 02/09 but no mention of this raid. I could not find anything in any of the 30 Div Infantry Brigade WDs. I will have a more detailed look later. 30 Div were certainly in the right area. EDIT: The March Table attached to Operational Order 119 shows that on the night 01 to 02/09 two Battalions of 89 Infantry Brigade (30 Div) were to relieve two Bns of 111 Infantry Brigade (37 Div). I checked the WDs of the Bns of 111 IB. Only 10 Bn Royal Fusiliers records an enemy raid in the early morning. This could be the raid mentioned in the 30 Div HQ WD. 90 Infantry Brigade (30 Div) were in the right sub sector but none of their Battalion WDs records an enemy raid. The best that I can find is a large enemy raid that happened on the night of 30 to 31/08 as 21 Infantry Brigade (30 Div) replaced it's two Bns in the line with it's reserve Bns. 19 Bn Manchester Regt relieved 2 Bn Wiltshire Regt in the right sub sector and 2 Bn Yorkshire Regt relieved 18 Bn Kings Liverpool Regt in the left sub sector. The WD of 21 IB records that at 10.18 pm (2218 Hrs) 100 enemy raided the line O.29.c.4.0 and captured no 8 post and a Lewis Gun. (There was an earlier enemy raid on 26/08/1917 against 2 Wilts, the raiders being identified as belonging to 179 IR). The WD of 2 Bn Wiltshire Regt records that the raid on 30/31 was by 22 Pioneer Bn and that relief (by 19 Bn Manchester Regt) was in progress during the raid. The WD of 19 Bn Manchester Regt also refers to this raid. Thankyou Brian, that's outstandingly helpful! I'll chase up some of those battalion war diaries. My hope was to put together a detailed account of this raid from both sides, somewhat like we did for Operation 'Kratzbürste' in our book Fighting the Kaiser's War, but sadly it looks like it will probably be a struggle to get enough material together. Well, we can but try! 24. Inf. Div. included the 2. and 5. Kompagnie of Pionier-Bataillon Nr.22 under the battalion staff of the same number - they would not have conducted raids on their own, but some of their personnel would certainly be attached to raiding parties should demolitions or other specialised engineering tasks be required. Sachsen in Grosser Zeit refers to drumfire and patrol / advanced post fighting in the IR 139 sector on the night of 26th-27th August, which inflicted some losses on the regiment. It goes onto state that on the following night (so 27th-28th August) the 'skirmishing' (Plankeleien) extended into the IR 179 sector, and that in the course of this IR 179 identified 30th Division opposite. No other raids are mentioned prior to 1st September apart from a pair of attacks by IR 179 on the night of the 19th-20th which captured a Lewis Gun and ID'ed 37th Division. The above is hard to reconcile with the British sources you quote; I'll pass this on to my co-author and ask him to consult the regimental history of IR 179 for clarification. I am struggling with this one as well. I have also tried running those dates through Geoff's Search Engine and can only find the odd casualty from any of the 30th Division battalions, which witht the number of working parties etc, is to be expected. I think it was 90th Infantry Brigade that was in the line that night. 16th Battalion Manchesters record being relieved in the early hours of 2nd Sept.
2nd Battalion Royal Scots Fusiliers suffered a number of casualties, due to shell fire. It looks like there is no easy way to account for the eleven prisoners taken by IR 133, let alone 'about forty' they supposedly killed. Possibly a working party from a different unit operating in the sector - divisional pioneers maybe? The WD of 2 Wiltshires for the raid on 30/31Aug records that 9 prisoners were taken by the enemy. I checked the WDs of 90 Infantry Brigade. 16 Manchester for 01/09 records, "In Messines trenches" and on 02/09, "Relieved by 9 KRR". 17 Manchester were holding the line in the right sub sector north of the River Douve. 18 Manchester were in Brigade support providing working parties and 2 Royal Scots Fusiliers had a working party which came under shellfire at 17 Manchester HQ. They suffered 4 k in a and 21 w in a. No mention of any raids. On the night of 29/30 Sep [Wrong! : Aug], 13/KRRC relieved 10/RF [in same brigade] in the right sub-sector of the front line. During the day of 30 Sep [Wrong! : Aug], the CO Lt.-Col. Chester-Master was killed by a German sniper while he was in the front line recce-ing the positions of enemy dug-outs. The entry for 01 Sep 1917 merely says "Nothing to report". 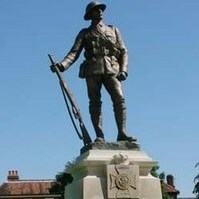 On the night of 02/03 Sep 1917, they were relieved in the right sub-sector by 2/Bedfords [89 Bde, 30th Div] and moved back to BEAVER CAMP into Divisional Reserve. No mention of any raid. For all of Sep 1917 casualties were: 7 killed, 6 missing, 4 POW, which does not match the German description of the raid. Short on detail on exactly where the brigade's sector was located, but they had come into the line via the support area at IRISH HOUSE, which is at 28.N.23.c.8.6 approx 2,000yds due W of WYTSCHAETE and in line with the general area of the raid. Phil's Corps Sector map above shows IX Corp's sector being manned by three brigades, two from 37th Div on the left (N) and one from the 30th Div on the right (S). I'll do some digging to see if I can confirm whether 111 Bde were 37th Div's left or right brigade on 01 Sep and from that we can at least eliminate the "right sub-sector" held by 13/KRRC and where the raid WASN'T! Orbat detail added. Wrong months corrected. No go on the 42nd Brigade Mark, they did not relieve the 90th Brigade until the 2/9/17, relief completed by 2am, on the 1st they were in the Neuve Eglise area. 02 Sep - morning. MESSINES. Relieved 18/Manchesters (30th Div) in Support to the Brigade holding the sector from the RIVER DOUVE on the left to the BLAUWEPOORTBEEK on the right. 02/03 Sep - relieved 16/Manchesters in the line taking up the left battalion front. 5/OBLI to their right. There's some further detail on the geography, but nothing about any raid, so I haven't transcribed this. I'm a bit puzzled by the description of the RIVER DOUVE (the DOUVEBEEK) being on the left and the BLAUWEPOORTBEEK being on the right - the latter is to the north of the former, which flows just S of MESSINES, so one would expect the right and left to be the other way round? Whatever, it certainly looks like this sector is a little to the S of the German 7442 grid square you are looking for. The Blauepoortbeek / Blauwepoortbeke appears to match the southern border of 30th Division on Phil's map above. I'm guessing that 'River Douve' is a mistake for the Wambeek / Wambeke which appears (on my German maps of the area) to be a plausible northern border. In light of the above my working assumption is that the date given in the regimental history of IR 133 (which did not appear until 1969, and was evidently written by Niemann without access to the war diary) is incorrect. The raid in the night of 30th-31st August must surely be the event Linke describes, as something on that scale and with that apparent degree of success would not go unmentioned in Sachsen in Grosser Zeit. "On 1st September IR 133 conducted a dashing patrol operation, which earned it the special commendation of the Gruppe [corps]"
9/KRRC were in 14th (Light) Division, not 30th Division. 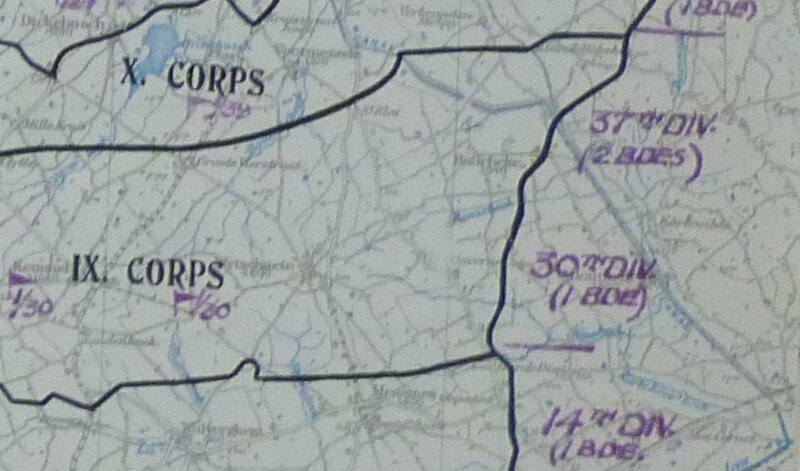 The sector marked on Phil's corps map as allocated to 14th Div seems to match the Blauwepoortbeek as its northern boundary and the River Douve/Douvebeek south of Messines as its southern. It seems 9/KRRC were the left battalion in that brigade sector and 5/OBLI were the right bn. Both were in 42 Bde. My assumption is the 9/KRRC war diary has just got its left and right transposed! I think the Wambeek is in 30th Div's sector to the north. The WD of 21 Infantry Brigade for Night of 30/31 August records "About 10-15 pm on the 30th Instant the enemy put up a heavy barrage on the front line and support line of the right Battalion in the line * (In Margin * D Coy 2 Wilts). It was apparent that a raid was being carried out and the SOS Signal was therefore sent up and our guns opened fire 3 minutes later"
It goes on to identify the location where the raid entered the line as O.29.c.4.0 to c.10.2 and that after the raid 10 men were missing. Agreed on all points, I got my British divisions muddled up. Could you just check the map ref O.29.c.10.2 again please? Is it O.29.c.1.2? Or perhaps O.29.c.10.20? 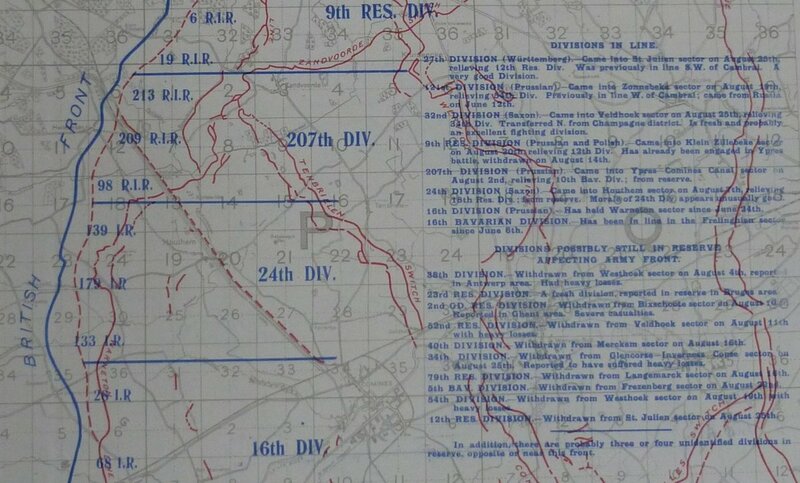 If you need to convert between German and British trench map references, you may find this Fourth Army 1:40,000 sheet helpful: it has the German grid overprinted onto a British map. A note printed in Green in the top right corner explains all. It had me fooled as well, but that is what it says. I would think that it must be C.1.2 unless it is right on the line of sub squares c and d i.e. c.10. or d.0 but that would make the yardage 600 yards. Either way it is compatible with the position of 133 IR as shown on the map in post 3. I was reading through the 30th Division HQ diary to see if there was mention; nothing jumps out but of note is the fact that the poor performance of the division on 31 July resulted in a very detailed post mortem of the battle which covers much of the diary content. Having had such a recent interest from higher up the chain of command in mid August would undoubtedly mean that at Bn, Bde and Div level there might be an even greater desire than normal to increase the casualty figures for the enemy caused by this raid to balance the loss of the prisoners in question. In the same way the Germans would also need to exaggerate the numbers considerably to match to demonstrate their success. The Wilts lost only a couple of men killed and I can't see any 19th Manchesters amongst those on the CWGC. There is mention in the raid in the 2nd Wilts battalion history which may be worth a look at; a Pte Bull was killed manning his Lewis Gun whilst a Sgt Bull was wounded; might be an interesting aspect to the story if they were brothers though this might be coincidence. I'm not aware of any personal accounts to men of the unit but there might be some in the IWM archives or within the Regt Museum in Salisbury. My hearty thanks to all of you - I've now purchased the war diaries of 21st Brigade HQ, 2nd Wiltshires and 19th Manchesters for the relevant period and will try to put a write-up together in German for my co-author this weekend. My suspicion was that prisoners may have been taken both from 2nd Wiltshires and from 19th Manchesters due to the (almost certainly fortuitous) occurrence of the raid during a relief. The war diaries seem to support this - while the Wiltshires reported 1 KIA, 14 WIA and 9 MIA, the Manchesters reported 1 KIA, 8 WIA and 10 MIA. This is certainly more than enough to account for the prisoners claimed by IR 133, though as expected their claims of British dead were clearly exaggerated. Having secured two valuable British unit identifications in one bag of prisoners, it's not surprising that the corps staff was very pleased with the raiders' achievement. One interesting discovery is that 2nd Wiltshires took three prisoners from IR 133 on 24th August, when a small Saxon forward patrol accidentally entered their line while trying to get back to their own lines with a British prisoner they had just seized! The brigade war diary mangles the unit identification as RIR 133 ('133 RIR'), an entirely different Saxon unit which was on the Eastern Front with 24. Reserve-Division at the time. It would seem there was a considerable amount of raids conducted by both sides in September, with a raid conducted by the 37th Division at the same time by the 10th Royal Fusiliers East of Spider Farm and several others. One German raid is noted for the use of flame-throwers. Another German raid on night of 4th/5th where about 200 Germans advanced from Jordan Trench on a line J.31.b.2.5 to J.31.b.0.5 against the 6th Bedfordshire Regiment. After the raid finished they managed to get identification from a dead German of 18th Reserve Pioneer battalion. Major General W.J. Williams of the 30th Division writes that "I fear that until the front is wired, these raids will be difficult to deal with, our front shell hole line is held by small posts. The entire front of one Brigade - the right - is now wired and we commenced to wire the left brigade front as soon as we took it over. Counter raids will be put in this week". Here's the English version of what I sent to my co-author. It focuses exclusively on IR 133. Evidently a lot more happened in the IR 179 sector, but this is intended to accompany other material from IR 133 specifically. Incidentally the regiment came from Zwickau, where my Great-Grandfather was born - however when he returned to Germany from Finland in summer 1914 he (wisely) chose to volunteer for the artillery in Dresden rather than going home and waiting for the call-up as an untrained reservist. The map shows the dispositions at the time of the raid, which occurred approximately in the area of the red 'X'. The raid described by Gefreiter Linke struck the British 21st Brigade of 30th Division, a New Army formation which (despite extensive combat experience on the Somme) had achieved little success and suffered severe casualties in the first phase of the Flanders offensive on 31st July 1917. After relieving 12th Australian Infantry Brigade on 22nd August, 21st Brigade held the front from the Blauwepoortbeek in the south to Bee Farm (Lemmerzahl Ferme / Lemmerzahlhof) in the north; they were therefore opposite both IR 179 and IR 133. At about 04:15am on 26th August, a party of about 60 Saxons attempted a silent raid on the left-hand company of the battalion, making “a determined effort to obtain identifications”. This failed, and the Wiltshires claim to have killed ten of the attackers, who were identified as “179th Regiment (STORM TROOPS)”. This unusual note suggests that the insignia of the Divisions-Sturmabteilung may have been recognised among them. Although the German sources insist that the major raid took place on 1st September, there can be no doubt that this was the same event described by the British on the night of 30th-31st August. Both of 21st Brigade’s frontline battalions were scheduled for relief, and the Wiltshires were awaiting the arrival of 19th Btn. The Manchester Regiment when a “remarkably accurate” 2 artillery and machine-gun barrage struck the front and support lines of the right-hand company at about 11:15pm. This forced most of the forward posts to take cover further back, leaving Posts Nos. 1 and 8 exposed to attack by about 100 Saxons. Despite “a stout resistance with Lewis Guns under heavy shelling and MG fire” 1 both posts were overrun and the survivors captured. The British defensive artillery fire responded immediately to SOS flares, inflicting losses on the raiders as they withdrew and allowing one prisoner to escape. Corpses found near the British wire were later identified as members of Pionier-Bataillon 22. The Wiltshires reported one killed, fourteen wounded and nine missing, while the Manchesters also lost one killed, eight wounded and ten missing. Since IR 133 had been relieved six days earlier by IR 102 of the neighbouring Saxon 32.ID and this incident occurred on the British left opposite IR 139 and 179, it can possibly be surmised that this group belonged to the Sturmabteilung der 24.ID.